Sailing gulet REX SICILIAE I was custom built in 2005 and measures 24m (78.8ft). 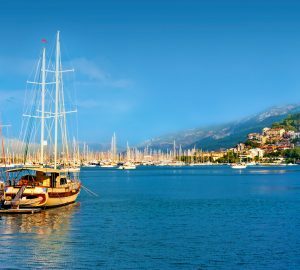 The yacht is available for sailing yacht charters in the West Mediterranean for 8 guests with the option of up to 12 guests in 4 en-suite cabins. Charter yacht REX SICILIAE I has a professional crew of 4 ensuring the utmost in luxury and relaxation. S/Y REX SICILIAE I features a warm inviting nautical interior, boasting fine mahogany panels, teak and holly floors and deluxe accommodations. The salon and dining is on the main deck level with 2 large L shaped sofas and formal dining table. Large windows allow ample natural light and premium views. Below decks, gulet REX SICILIAE I offers 4 double en-suite cabins, each cabin has a single berth extra, idea for children if required. The master suite is aft and full beam of the yacht with a center lined double bed and sofa. The VIP cabin is forward and full beam of the yacht with a double bed and sofa. Two port and starboard cabins offer double beds. All 4 cabins are en-suite and feature an elegant traditional décor. Sailing yacht REX SICILIAE I has plenty of options for exterior living. The aft deck is shaded and boasts and alfresco dining option and wet bar. Safety rails and wide wrap around decks make walking around the yacht effortless, where guests will find ample sunpads on the large foredeck. Charter yacht REX SICILIAE I has a ketch rig, when not under sail she is powered by one CAT 500hp engine that can reach speeds of up to 9 – 11 knots. Sail yacht REX SICILIAE I is based in the Aeolian Islands, Sicily. S/Y REX SICILIAE I offers accommodation for 8 charter guests in 4 double cabins, 4 additional guests can be accommodated in a single Pullman berth in each cabin. The master suite is aft and full beam of the yacht with a center lined double bed and sofa. The VIP cabin is forward and full beam of the yacht with a double bed and sofa. Two port and starboard cabins offer double beds. All 4 cabins are en-suite and feature an elegant nautical décor. The Italy based REX SICILIAE I sailing yacht has the following Tenders & Toys onboard: A 5 mt dinghy with Yamaha 10 HP outboard engine, generator 16 Kw. Complete navigation instruments. Audio Visual Equipment and Deck Facilities TV, Surround, DVD, stereo, microwave oven, freezer, fridge, dishwasher, barbecue, 2 deck showers, air conditioning, 5 mt dinghy with Yamaha 10 HP outboard engine, generator 16 Kw. Complete navigation instruments.